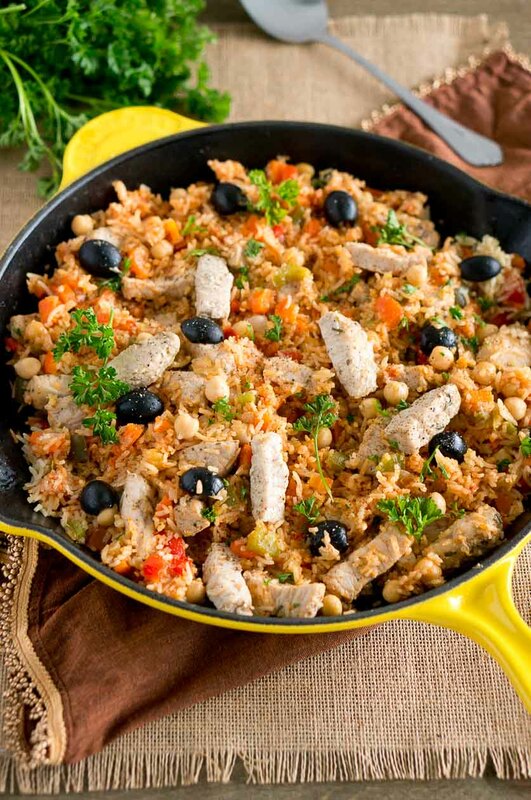 This One Skillet Mediterranean Pork and Rice is a delicious meal the whole family will love. It’s easy and quick – only 30 minutes and one pan meal. 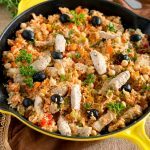 I whipped up this One Skillet Mediterranean Pork and Rice earlier this week and I have to say, it was amazing! The best part is, it took about 30 minutes to make, ensuring that I was able to deliver real flavor real fast even with my crazy, busy schedule. 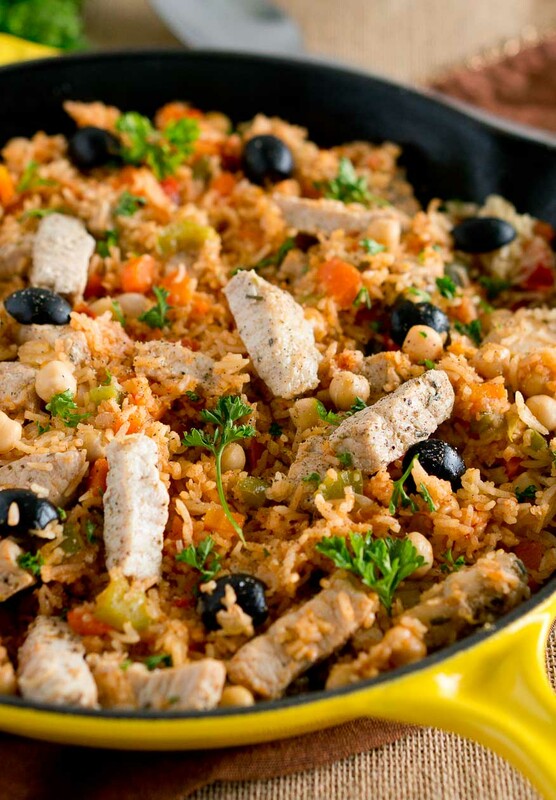 This One Skillet Mediterranean Chicken and Rice is a classic meal the whole family will love. This rice pilaf tastes amazing! 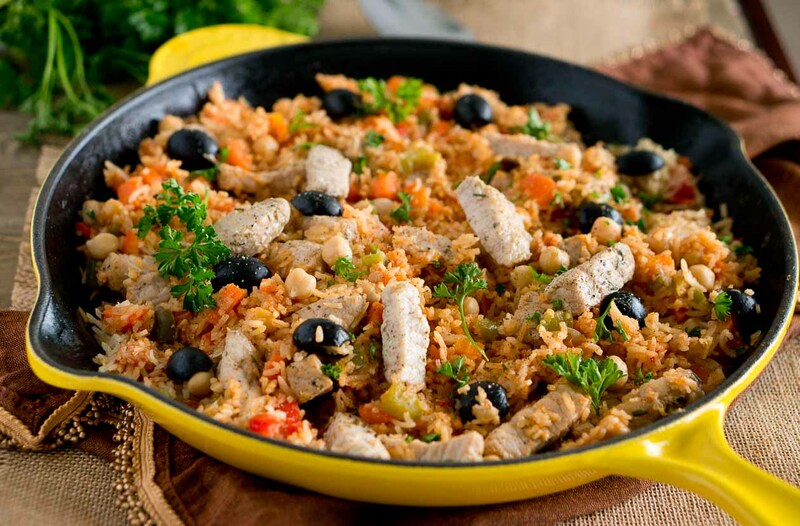 The lemon zest and juice add a fabulous fresh flavor to the rice which make it a perfect Spring meal. This amazing dinner dish also yields leftovers that can be used to make lunch the next day. I always try to cook enough to have plenty for the next day, and the leftovers from this One Skillet Mediterranean Pork and Rice can easily be turned into the perfect Mediterranean Pork & Rice tacos. Or you can cook the rest of the pork loin and add the pork loin slices to a salad. Smithfield® Marinated Fresh Pork is made from 100% fresh pork with no artificial ingredients. It’s slow-marinated and perfectly seasoned in a variety of delicious flavors including Roasted Garlic & Herb, Applewood Smoked Bacon, Slow Smoked Mesquite, Roasted Garlic & Cracked Peppercorn, and more. With a variety of fresh cuts including loin filets, sirloins, tenderloins, and roasts, Smithfield® Marinated Fresh Pork is a perfect fit for all cooking styles and dishes. It can be prepared in different ways – sauteed, roasted or grilled. Plus, it can also be sliced or cubed for even faster cooking. 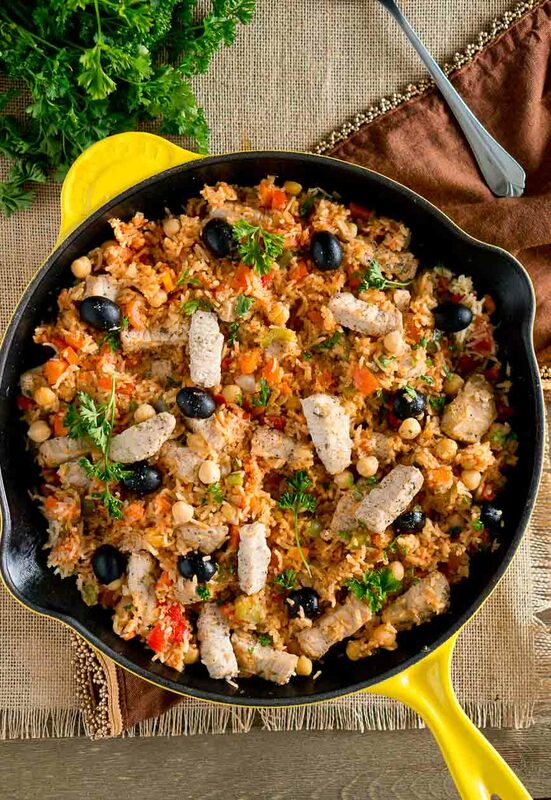 Not only do they have an amazing variety of flavors but their 100% pork options are pre-marinated, making them an easy dinner option for any night of the week. This always delivers real flavor real fast! 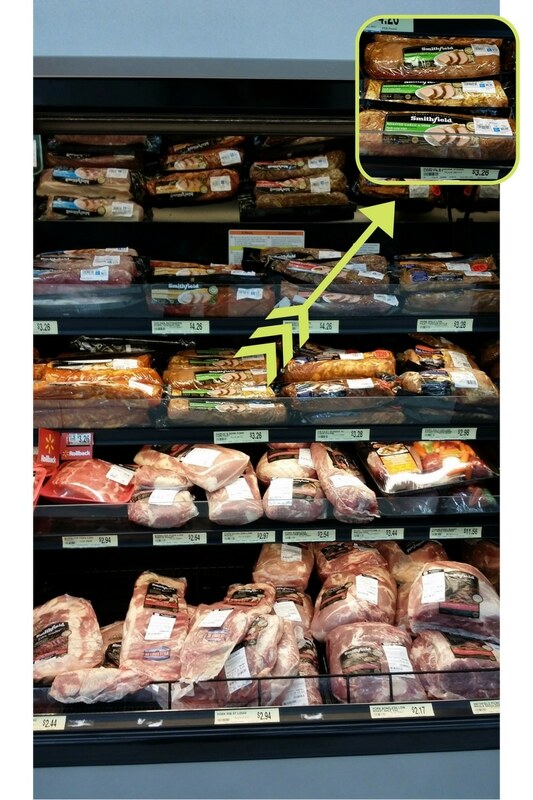 That’s why Smithfield® Marinated Fresh Pork from Walmart is a staple in my refrigerator and my freezer. Plus, since right now I can earn $1.00 off any Smithfield® Marinated Fresh Pork at Walmart with this Ibotta offer, it only makes sense that we’re serving up tons of the quick and easy flavor that it provides! You can also enter to win a trip to wine country. To enter, submit your tip on how you get dinner ready in 30 minutes or less using Smithfield® Marinated Fresh Pork, for a chance to win a grand prize trip to wine country or hundreds of other great prizes! Plus, you can vote on your favorite tips and tricks to achieve real flavor, real fast, and you’ll be entered to win a $25 VISA gift card. 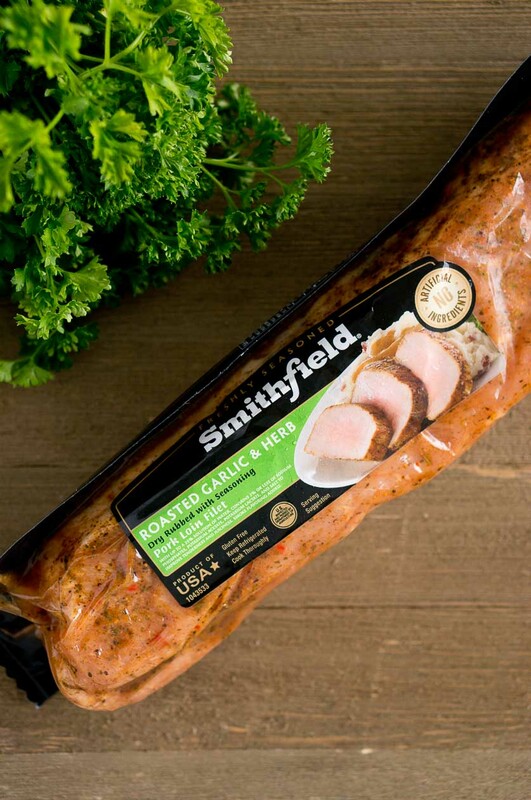 Be sure to check out Smithfield’s website for all other marinated pork products they offers. You can also follow them on social media: Facebook, Twitter and Pinterest. 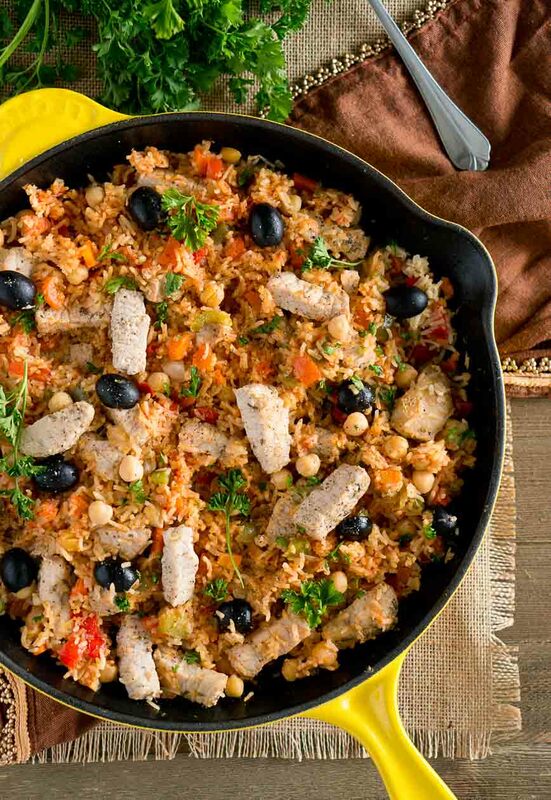 This One Skillet Mediterranean Pork is a delicious meal the whole family will love. It's easy and quick - only 30 minutes and one pan meal. Heat oil in a large skillet over medium-high heat (I used 12" skillet). Add pork loin filet strips to the skillet, and cook for about 5 minutes, or until cooked through. Transfer cooked strips to a plate. Add chopped carrots, bell pepper, onion, and garlic to the skillet, and if necessary add more olive oil. Season with salt and freshly ground black pepper. Saute for about 5 minutes, or until vegetables are tender. Add rice to the skillet and stir well. Season the rice-vegetable mixture with salt, black pepper, and oregano. Add lemon zest to the vegetable stock and pour over the rice mixture. Bring to a boil, cover and simmer for about 12-14 minutes until rice is cooked. Add the juice of 1 lemon and the cooked pork slices to the rice-vegetable mixture and stir well. Add garbanzo beans, olives and garnish with chopped fresh parsley. I love skillet meals like this. So good! Made this for dinner tonight. It was fantastic! Great flavor. My entire family loved it and asked for it to be a regular! This sounds perfect for weeknight dinner!